Just why did Frida Kahlo have such an obsession with animals in her work? From monkeys to stray dogs, what fuelled Frida Kahlo's fixation with animals? Why was the Mexican painter, Frida Kahlo, obsessed with monkeys - not to mention parrots, pre-Hispanic dogs and deer? Eight of the large number of self-portraits she painted in her short life (55 out of 181 paintings) feature spider monkeys. The first of these (painted in 1937) featured just one monkey, but by 1942 Frida was expanding the menagerie of exotic animals that were her friends. The decision to include monkeys as her constant companions was not arbitrary. Frida kept monkeys as pets in the garden of the Blue House in Coyoacán. Her monkeys, she said, symbolized the children that she was never able to bear because of the horrific injuries she had suffered in a bus accident in 1925, which led to medical complications, an abortion and several miscarriages. Frida was 36 when she completed this painting in 1943. She was in a more hopeful mood than she had been in the late 1930s when the affairs of her artist husband (the serial philanderer, Diego Rivera), and her own liaison with the Soviet revolutionary Leon Trotsky (exiled in Mexico between 1937-1940), had led to a divorce in 1939. Frida with an Olmec figurine, Coyoacan 1939. One year later, however, the couple had remarried. And by 1943 Frida, a largely self taught artist, had been welcomed into the academy where she took up a teaching position in the School of Painting and Sculpture in Mexico City. But academic recognition of her talent could not overcome her continuing health problems, which soon obliged her to move her classes to the Blue House in Coyoacán. There, the number of her pupils dwindled to just four who became known as her loyal "Fridos". Some critics argue that the four monkeys might represent these beloved students. Monkeys also had a strong symbolic importance in pre-Columbian society. Frida, forever alert to the artistic politics of the Mexican Revolution (1910-1940) and its celebration of pre-Hispanic peoples, considered pre-Hispanic art to be the foundational source for all Mexican art. Both Frida and Diego became obsessive collectors of pre-Columbian artifacts and the library of the Blue House reveals evidence of their familiarity with the illustrated codices of the pre-contact and immediate post-conquest eras that are still key sources for understanding Aztec society. In the Aztecs' world, monkeys are an important presence. They were the gods of fertility, noted for their cheeky lasciviousness and uninhibited sexuality, and they were also intimately connected with dance and the arts. One of the Aztec calendars even had a day, Ozomatli, dedicated to monkeys and linked to the god of flowers and song. For Frida, whose public profile rested heavily on carefully constructed performances and costuming, there was no better symbol of her transgressive sexuality and her longed for (but never realised) fecundity. In the 1943 painting, there are four monkeys. Two of them hug Frida. Two more behind her are half buried by the leaves of a bird of paradise plant featuring a brilliant orange and blue flower. On Kahlo's white cotton blouse or huipil (itself part of the carefully chosen peasant and indigenous costuming that Frida adopted in everyday life), two of the monkeys point to a red and orange Aztec glyph (or sign) for earthquake or movement (ollin), enclosed in a rectangle. The glyph is identical with an image in the Florentine codex, a document with which Frida and Diego were familiar. Many of Frida's self portraits were commissioned. One of her first monkey paintings, for example, was bought in 1938 by the industrialist, philanthropist and first president of the Museum of Modern Art in New York City, Anson Conger Goodyear. Goodyear was one of a group of wealthy figures, from business, publishing and Hollywood, as well as from the private sector and diplomatic circles in Mexico, whose commissions enabled Frida and Diego (both of whom were Communist revolutionaries) to pay for Diego's lavish collecting and Frida's onerous medical bills. One of these patrons was Jacques Gelman, a Jewish exile from European fascism, who made a successful career in Mexico as film producer and early promoter of the actor Cantinflas. Together with his wife Natasha, Gelman assembled a spectacular collection of Mexican and European art. 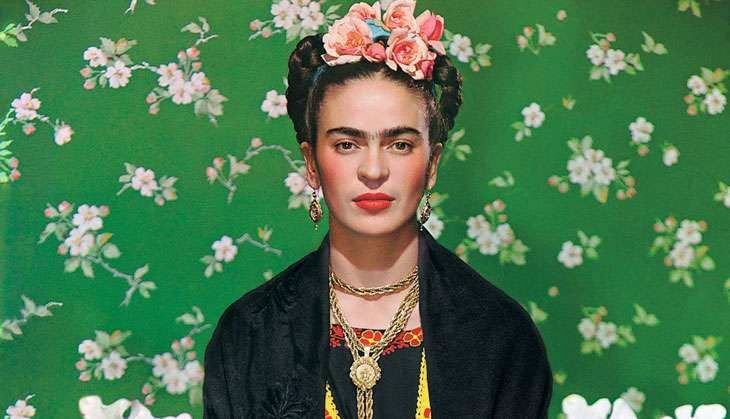 Some of their Frida and Diego paintings are now on show at the Art Gallery of New South Wales. Frida Kahlo died in 1954, a short while after she had been carried in her sick bed to participate in a demonstration against US political and military intervention in Guatemala, where the CIA had helped overthrow the elected government of Jacobo Arbenz. Following Mexican tradition, Frida's coffin was laid out for viewing, and covered with the hammer and sickle flag of the Mexican Communist Party, which both Frida and Diego had rejoined in the early 1950s. The coffin was displayed at the Palace of Fine Arts, where leading figures in the art world and humble citizens came to pay their respects. The museum director was dismissed shortly afterwards for this political indiscretion at the height of the Cold War. Frida's room at the Casa Azul has been left as it was at the moment of her death. The Blue House, after all, was the place where she was born and where she and Diego lived for most of their lives. It is also the number one site for fans on the pilgrimage route that now brings tens of thousands of travellers to Mexico City, attracted by a "Fridamania" fuelled by movies, fashion and a never-ending supply of consumer articles carrying the Kahlo brand. Frida Kahlo and Diego Rivera from the Jacques and Natasha Gelman Collection is showing at the Art Gallery of New South Wales from 25 Jun - 9 Oct.
TWEET THIS Just why did Frida Kahlo have such an obsession with animals in her work? From monkeys to stray dogs, what fuelled Frida Kahlo's fixation with animals?